«©NCSX» Tokememo Girl's Side 3rd Story was originally released on the Nintendo DS in 2010 and Konami upgrades the game on the PSP. The protagonist is a girl who attends a high school for three years and encounters a coterie of handsome boys who set her heart aflutter. Updates to the PSP rendition include a new character, a revised 'Approach Mode' where the protagonist strategizes on how to contact a boy, and a 'Live 2D' feature where the boys speak and react with lifelike facial expressions, tics, and gestures. 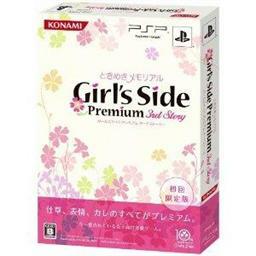 The first production of the game will ship with a bonus Girl's Side Premium 3rd Story CD. This document is ©NCSX 2012. All rights reserved. No reproduction in whole or in part of this document may be made without express written consent of National Console Support, Inc.